I did it again. Pillow cookies. I think I may be in love. 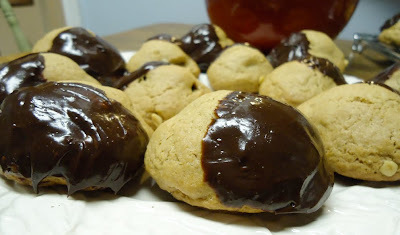 You may be familiar with the Mocha Pillow Cookies I made last week…mostly because I will not shut up about my giveaway! Anywho, I mentioned that the brownie recipe made way more brownies than the cookie dough required. What to do with a half a pan of leftover brownies? Do I hear a call for MORE PILLOW COOKIES??? Of course. Happy to oblige. 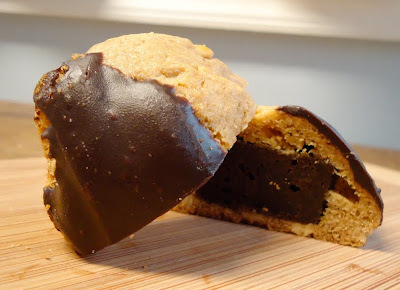 And these ones took pillow cookies to a whole new level. Brownie center? Check. Peanut butter cookie dough? Check! And then dip them in dark chocolate gnache? Well obviously! I brought some of these to work, and shared some of them with my roommates. And the rest? Well…let’s just say I had a cookie party…with myself…whoops! For the Fudgey Brownie recipe, go here. Mix butter, peanut butter, and sugar thoroughly. Add eggs and vanilla and water and beat together. Add dry ingredients and mix in completely. Refrigerate dough at least 30 minutes (the longer you refrigerate the easier the dough will be to work with). Form pillow cookies (see directions here). Bake at 350* for about 18 minutes. Chop the chocolate and put it in a heat-proof bowl. Heat the cream in a saucepan (or the microwave) until it is hot but not boiling! Add the cream to the chocolate, and add the vanilla. Mix until smooth. And now for the best part. Take your cooled cookies. Dip them in the gnache. 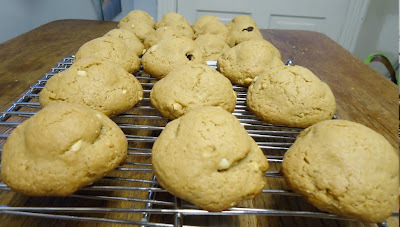 Let the gnache cool/harden on the cookies. Give yourself a high-five. These cookies are awesome!